Between 1791-1802 blacks and mulattos in Saint Domingue struggled to become emancipated. Slavery was always a controversial topic in Saint Domingue because some people wanted slavery, while others wanted to abolish it. What was considered emancipation during this time period? There were many thoughts of what emancipation actually was. Emancipation meant that their was no more slavery, people of color would have the same rights as whites, and slaves would be able to own their own land. Slaves thought that owning land was the key to their freedom. But because slaves were seen as society’s lowest. At the time free people of color and gens de couleur had some rights. They had basic rights but they still weren’t allowed to participate in Saint Domingue’s political process. The fight for emancipation began in 1789 when the Declaration of Rights came out. Free blacks and Gens de couleur wanted the same rights as whites. Some of the free blacks and gens de couleur went ahead and created their own societies such as the Society of Friends with Blacks and Society of American Colonists. Through these organizations they rallied and listed their demands. Many of these groups drafted their own decrees saying that they wanted to be promoted under the same conditions as whites, have representation in the Assembly, and let black and mulattos serve in the government. By 1790, revolts started to break in Saint Domingue. Those who demanded rights were often executed. The violence continued and slaves started to take part. Slaves would participate by attacking plantations and their owners. They wanted appropriated land and subsistence farms they could live on. Plantation owners were surprised by these revolts because many of them believed that slaves were not smart enough to plan the revolts. There was also fear that slavery revolts would jump to neighboring islands that the British and Spanish owned. In February of 1793 Britain and Spain entered the war in Saint Domingue. The British and Spanish used tactics to get the slaves on their side. In May of 1793 provisions of the Code Noir were upheld. The French agreed to have planation owners used less violence as well as receive more days off. The French used this tactic to try and lure slaves on to their side. Many slave and slave leaders refused to join because of the arrival of the new Governor General Galbaud who was seen as very radical. In 1793 the Proclamation of Emancipation was issued. The decree stated that the principal of the Declaration of Rights of Man and Citizen would be applied to Saint Domingue and slaves would be free. Even though the slaves were considered free, they were still forced to follow labor agreements and stay on the plantations and do the same work they did when they were slaves. They also had to follow and elaborate set of restrictions; for example having permission to leave the plantation. They only thing that truly changed with the 1793 Proclamation of Emancipation was how slaves were physically treated. Plantation owners were no longer allowed to physically whip the slaves. Slaves however did not see this as emancipation and continued to revolt. They still believed that could get a better deal. Also around this time, different areas of Saint Domingue were experiencing war. In the west the mulattos were for equality as well. Mulattos in a way were looking for emancipation but it was a different type. The mulattos were looking for having the opportunity to take part in Saint Domingue’s political process. In the North, Jean-Francois who was once a slave and became a maroon was able to negotiate with the French for amnesty for all slaves, improving conditions of slaves, and freedom for 50 leaders. In 1794 the Convention officially abolishes slavery in France and the French territories. With the abolishment of slavery, their was concern that the economy would no longer prosper. Because of this concern, right after the Decree of 1794 was put into effect, a new work code was created which made plantations owners give former slaves a third of the plantation revenue and an additional free day. Former slaves were still resisted against this and began to appropriate land for themselves. Even though slavery was officially abolished, the struggle would still continue for Saint Domingue. There was struggle to enforce the emancipation of slaves. The Constitution of Year III ensured that colonies would have the same laws as France and all people would be considered citizens. But their was still fear the slavery would return. Toussaint used the Haitian Revolution to rise up. Toussaint would go on an make surethat all people would be considered citizens and the emancipation decree would be enforced. He did this by taking out his rivals such as Sonthonax and Laveaux by forcing them to represent Saint Domingue in the Council of 500. “The First Emancipation Proclamaton.” A Concise History of the Haitian Revolution. N.p. : n.p., n.d. N. pag. Print. Geggus, David Patrick. “Doc. 21 Free People of Color Organize.” The Haitian Revolution: A Documentary History. N.p. : n.p., n.d. N. pag. Print. Geggus, David Patrick. “Doc. 25 The May 1791 Debates.” The Haitian Revolution: A Documentary History. N.p. : n.p., n.d. N. pag. Print. Geggus, David Patrick. “Doc. 37 The Slave Insurgents Make Demands.” The Haitian Revolution: A Documentary History. N.p. : n.p., n.d. N. pag. Print. The emancipation of slaves in the territory of Haiti was similar in comparison to other country’s histories of freeing enslaved peoples throughout their independence or younger years of existence. Prior to the 1800s the idea of slavery and movement was not close to the emancipation process seen through the French and then the Haiti Revolution. And in fact, after this emancipation process and into the 1800s the idea of freeing slaves, allowing the different races similar freedoms and ending the slave trade in the Atlantic wouldn’t abruptly end or get resolved. So, the ultimate question is how actually would the slaves become Freed? A document, a speech or a governmental action can have a big meaning, but the effects of something such as emancipation in Haiti would take years of continuing struggle to fully stimulate the population majority. The struggles, the violence, the disorganization, the French influence changing would all play a role in the actual freedom of the former slaves in Haiti. The slaves became freed when the declaration for their emancipation came through, but were not freed until many years after that through the process and through the changing of scenery completely in Europe and the Americas. It was referenced numerous times in passages in the Popkin readings for class that the blacks would have an almost impossible time surviving the newly proclaimed freedom the documents of emancipation gave them in Saint Domingue. Being emancipated wasn’t something would be adjusted to overnight. As history shows, any emancipation process takes years to really be recognizable, Saint Domingue was no different. The rights given on paper or the rights the former enslaved peoples were granted seemed adjustable, somewhat fair on paper. The rights that were really recognized were barely enough to allow blacks in Saint Domingue to survive. The struggle to obtain any land, have any public opinion, conduct trade or have personal freedoms would continue to be problems. On top of this, the violence and the revolution itself were from over when the emancipation took effect. So, to even feel any sort of real emancipation the former slaves would have to survive the harsh conditions and live past all the violence and power struggle that was going to continue for the next decade or so. The emancipation process most are familiar with would be the slaves in the United States and the Civil War. President Lincoln’s famous Emancipation Proclamation has been taught in primary and secondary history courses and was a very crucial moment in this country’s history. Obviously historians have written at long lengths about both of these processes, but for this class’s purpose it is important to note that the enslaved peoples both struggled for any real rights through the emancipation. In both Haiti and the United States violence, a battle for rights and a definition that only looked good on paper would be the primary theme for the black people. It would take nearly hundred years arguably for any major recognition and changes to occur for the blacks of the United States in their battle for real rights. The emancipation were intended to make races just, but the time and sacrifice needed after that proclamation would almost be as bad as a struggle than the enslaved period! Also, in both regions the former slaves would continue fleeing from their locations to new homelands in an attempt to escape the prejudice and violence, seeking a better quality of living. The image shown above is another example of how the former slaves looked to gain almost a feeling of revenge, but actual freedom by hanging the former masters and landowners that flexed their powers formerly on the slaves. Emancipation wasn’t going to happen overnight. The idea didn’t happen overnight, the process didn’t happen overnight and the consequences weren’t going to vanish overnight either. Emancipation in Saint Domingue was a rocky road, with many decrees being said, then revoked later on. However, eventually the enslaved were freed, though what they could and could not do was limited. They could participate in civil society, but the former enslaved had to stay on the plantations that they worked during their time as a slave. They also were no longer allowed to be violently punished. But why 29 August 1793, after so long? In 1793, the French were facing ma ny issues both continentally and on the island. There was a deadlock in the legislative assembly, as well as a looming threat of invasion from Britain and Spain. In August 1793, Spain also proceeded with their plans for invasion of the island. There was also an increasing rate of rebellions on the island against the institution of slavery. Strong leaders such as Toussaint Louverture were emerging, and winning rebellions. Because of the tensions France was facing with the other powerful Empires of the time, the French thought one way to limit the tensions in Saint Domingue would be to grant emancipation to enslaved men that joined their army, as well as their families (Colwill, 131). This was a great incentive for many enslaved, because though Britain and Spain were promising emancipation for the slave themselves, it did not include their families. However, though many did join the French Army, many were also weary to trust the French. The French had to do something to broker some sort of peace and resolution, so before emancipation, they tried a few other strategies, such as the Second Civil Commission on 20 September 1792. The commission sent Sonothax and Etienne Polverel with 6,000 troops to San Domingue in hopes that they could enforce the April Decree, and end agitation for colonial autonomy. However, Sonothax was a known abolitionist, and because of Frances preoccupations, Sonothax and Polverel were able to overstep their bounds in governing the island. One of the ways that they did this was through their 11 July 1793 proclamation that stated any enslaved woman that married a freed man was free, and a few months later, on 29 August, emancipated everyone in the Northern part of the province (Colwill, 143). However, one of the reasons that Sonothax may have emancipated the enslaved was to try and broker a sort of peace with them. There had been many uprising that were getting more extreme over the summer of 1793. In that June, the city of La Cap was burned by the rebellion, and forced many white colonists to flee to the United States (Gueggs, ch. 43). The increasing violence of the rebellion was not unsuspected. As Robespierre suggested, by the colony continually hindering rights of freed blacks, and grouping them more so with the enslaved, it would only cause violence and disruption (Gueggs, ch. 25). In fact, freed black men were often blamed for the slave revolts, further driving them away from the side of the white colonists, and towards the sympathy of the enslaved. This could be seen a few years prior in the 16 August 1791 attack on plantations in the Northern part of Saint Domingue. Because white slaveholders did not think that the enslaved had the capacity to plan such an event, they blamed the freed blacks, and became fearful of them (Popkin, 36). This fear led to a lot of discrimination, and the whites began to strip free blacks of their rights. Because of this, even more insurrection spread throughout the colony. Because of the growing disillusionment of both the freed blacks and the enslaved, by the end of August 1793, Sonothax felt that he had no choice other than emancipation to keep the support of the blacks in the colony (Popkin 59). He did so to try and preserve the plantation society that so many people in the world relied on while trying to keep peace. Because of this, the formerly enslaved were made to stay on their plantations while they would be given compensation for their work, and their masters were no longer allowed to torture or abuse them. Colwill, Elizabeth. “‘Fetes de L’Hymen, Fetes de la Liberte,’ Marriage, Manhood, and Emancipation in Revolutionary Saint-Domingue.” Journal of Haitian Studies 17.1 (2011): 125-53. PDF file. “La Cap.” Wikipedia Commons. Wikipedia, n.d. Web. 26 Apr. 2015. <http://upload.wikimedia.org/wikipedia/commons/c/c2/Frontispiece_from_the_book_Saint-Domingue,_ou_Histoire_de_Ses_R%C3%A9volutions._ca._1815.jpg>. “Map.” Wikimedia Commons. N.p., n.d. Web. 26 Apr. 2015. <By http://maps.bpl.org [CC BY 2.0 (http://creativecommons.org/licenses/by/2.0)], via Wikimedia Commons>. The events leading up to Haitian Independence in 1804 were full of deception, corruption, loyalty and disloyalty, the mass murder of peoples, and above all, a undeniable motivation to take control of the island by both sides. While some argue that the cause and success of the war in Haiti was due partly to the war between European powers, the war was essentially one between two peoples: the oppressors and the oppressed. Within this war, there were two prominent Haitian leaders, known as black insurgents, who fought for the emancipation of their nation, and eventually independence – Toussaint Louverture and Jean-Jacques Dessalines. While Toussaint is more widely known to the world as the leader of the Haitian revolution, Dessalines arguably equally, if not more, contributed to revolution; and, after Toussaint’s capture, Dessalines is the leader that ultimately led Haiti into independence. Although Dessalines’ path to independence was full of highly questionable and controversial tactics, he, and the indigenous army of St. Domingue, won back their full freedom and took control of their own nation. However, leading up to Dessalines’ takeover, Toussaint ran the colony in the most efficient way he thought possible during the years of emancipation. In August 29 1793, Sonthonax, civil commissioner and advocate for emancipation, used his assumed power to free the enslaved stating, “The French Republic wants all men without distinction of color to be free and equal” (Geggus 107) . He did this largely to gain the support of the colony to defeat the Spanish army, which was also rallying black insurgents promising freedom. However, once the proclamation was enforced, the major black insurgents joined the French side of the army, defeating both the Spanish and the rebellious within the colony. During the eight year period that followed, the battle between the black insurgents, such as Toussaint and Dessalines, and the French army lessened. This was largely due to the combined forces of some black insurgents and the French army, working together to keep peace within the colony. After Sonthonax left the colony in 1797, Toussaint took the opportunity to run the colony as he saw fit, holding moderate power in 1798-1801. Toussaint took control as the official representative of France’s power within the colonies, while also continually advocating for the rights of the now emancipated people; he was more of a mediator between France and the colonies, making sure to stay loyal to both France and the colony. Moreover, Toussaint used his power to enforce a strict system within the colony, following the details of the Emancipation Proclamation in 1793. Additionally, because of his loyalty to France and French policies, he despised the voodoo that some Haitians practiced and made Catholicism the colony’s only legal religion. Also, Toussaint enforced strict morality rules onto the citizens, both of color and not. Additionally, within the emancipation proclamation, Sonthonax made it clear that emancipation did not necessarily equate to the end of the current agricultural system in place. In Article 9 of the proclamation, it sates, “Slaves currently attached to the plantations of their former masters will be obliged to remain there and work the land” (Geggus 108) . Within this system, however, the workers will have minor benefits and the laws laid out in the Code Noir would also be enforced, meaning the workers would now have certain days off and more legal rights. Lastly, even though the colony was now ruled by one of its own natives, Toussaint still ran into major issues during his authoritarian rule of the colony. Jeremy Popkin, author of A Concise History of the Haitian Revolution, states, “As [Toussaint] tried to create a powerful government capable of protecting the freedom of the black population, he found himself caught up in a series of conflicts with opponents who resented his authority” (Popkin 90) . Popkin goes on to cite Toussaint’s conflicts domestically; however, internationally, Toussaint would soon be facing larger issues with the French government, specifically Napoleon Bonaparte. “The Emancipation Proclamation of August 29 1793.” In The Haitian Revolution: A Documentary History, edited by David Geggus, 107-108. Indianapolis: Hackett Publishing Company, 2014. “Toussaint Louverture in Power, 1798-1801.” In A Concise History of Haitian Revolution , by Jeremy D. Popkin, 90-113. Chichester: Blackwell Publishing, 2012. Was it Really Emancipation in Saint Domingue? The Haitian Revolution was quite unique in the way that slavery was handled. The nation of France in their own countryside was struggling to determine who should receive the full political rights. If they were having struggles at home, how were they going to control their territories that are an ocean away? It had been decided through the Declaration of the Rights of Man that all men are made equal. This, in essence, would have made all of the enslaved men on Saint Domingue free. Sonothax and Polverel had proclaimed that all men would be emancipated in 1793. However, this was just the start of a struggle to enforce emancipation. This was not an official decree because Sonothax hadn’t the power to free everyone. The government and structure of the colony was in absolute chaos throughout the entire Haitian Revolution and it was inevitable that France would lose the territory; it was just a matter of time. “Official” emancipation is not until they declare for their independence after pushing the French out of Saint Domingue. Official is in quotations because of the obscurity of this entire situation. Although the enslaved people had legally been free prior to independence, there was not a way to enforce it. The colony had also been economically powerful because of their plantation-driven system. Without people to work the plantations, the production would stop, which would lead to a stop in trade and a slower economy. There were still plenty of rebellions happening over time, but they still needed overseers to watch over plantations to keep economic growth stable. The People of Saint Domingue never really gained all of their freedoms from emancipation until the new country of Haiti was created. 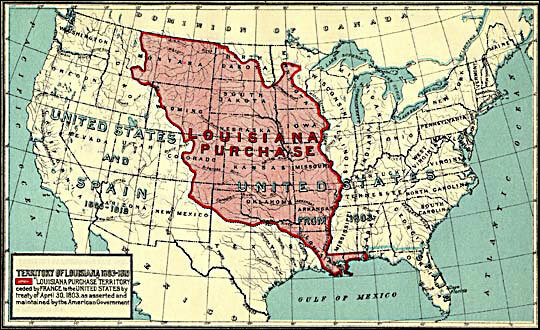 The Louisiana Territory is often regarded in American history as a bargain. It is almost always looked at from the American perspective. However, it really had much more world significance than people realize. Yes, we know that Thomas Jefferson and Napoleon Bonaparte were the key individuals in orchestrating this exchange, but why was it so significant to Saint Domingue? There was a significant amount of pressure on Napoleon financially because of the raging wars with Britain and Spain in the European continent. The colony of Saint Domingue was in absolute chaos. It certainly seems like Napoleon was giving up on colonialism in the western hemisphere. By selling the Louisiana Territory, he pulled out a French presence. There would be no more reinforcements from Louisiana to help in the colony. French imperialism in the western hemisphere was dead (at least while Napoleon was in power). The concept of leadership and influential powers throughout the Haitian Revolution were quite strange. Toussaint Louverture spent practically all of his time “leading the revolution” while he was in the French military, fighting for France, whether it was against the Spanish or the British. He had gained control of thousands of troops over his time and would eventually use them to rebel and fight off the French. These military revolts made fighting seem like a civil war. Both General Leclerc’s army and Toussaint’s army sang the same revolutionary songs, but they were fighting each other for control of the same territory. Eventually, Toussaint would surrender to Leclerc and he would be sent to prison in France, where he later died. Another revolutionary leader was Jean-Jacques Dessalines, who also happened to be in the same situation as Toussaint. He was fighting for the French and rebelled against them in the same battles as Toussaint. He also surrendered to Leclerc, but he was not seen as a big of a threat as Toussaint. This changed the course of what emancipation would look like. Dessalines was a much more violent man than Toussaint. He led more viciously, while Toussaint would have been more diplomatic. After the French had finally surrendered to Dessalines, he wanted to rid the colony of whites. Could this be considered genocide? Dessalines was deliberately focusing on the white people, and massacring them. This is really interesting because it seems like a very different vision from Toussaint. There was the belief that the plantation system should exist, and overseers could still exist, and they could still be white, but the cultivateurs would be paid for their labor. Some, like Dessalines, would argue that this is still a system of slavery. Others, like Toussaint, would think that it was just a colony reaching its potential economically. This debate could continue indefinitely. The people of Saint Domingue would eventually be the people of Haiti. Their awkward fight for emancipation was never clear until the country declared their independence. There are many situations in which the revolution could have gone a different direction; the most important being the final revolutionary leader. 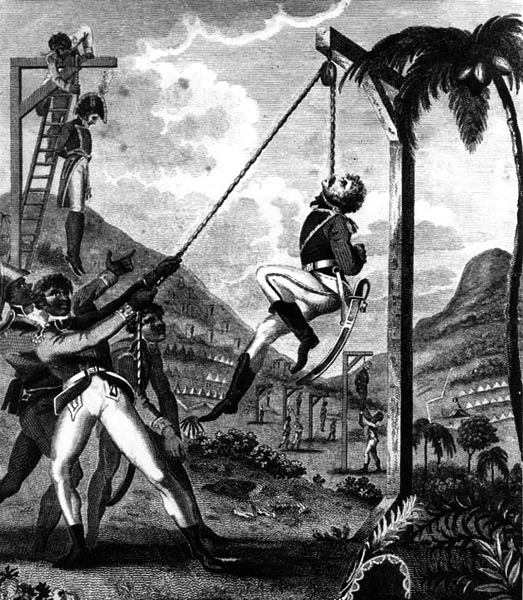 If Dessalines had been put into prison instead of Toussaint, how would Haiti look today? Dubois, Laurent. Haiti: The Aftershocks of History. New York: Metropolitan, 2012. Ebook. Geggus, David. The Haitian Revolution. Indianapolis: Hackett Publishing Company, Inc, 2014. Ebook. Popkin, Jeremy D. A Concise History of the French Revolution. Chichester: Wiley-Blackwell, 2012. Ebook. In 1791, the white population held most of the power politically and militarily. They may have not been the majority of the population, but they had control. After outbreaks of war and dramatic events for two years, the emancipation of Saint-Domingue’s slaves happened in August of 1793. By this time, most of the white population left, or even fled, the island due to it being so unstable and unsafe. As Jeremy D. Popkin states, “Between 1793 and 1798, the violence in Saint-Domingue gradually subsided and a new society, from which slavery had been officially banished and in which people of all colors enjoyed the same legal rights, started to take shape.” (Popkin 62) With the lack of white presence, free men of color now rose to high positions in the French army. These new roles in the military allowed them to also have political power. Many people believe that the Haitian Revolution was the sucessful slave revolt in history and to establish an independent country called Republic of Haiti today. The colonial system of slavery had been successfully functioning until a violent slave revolt in 1791. After the slave uprising in French colony of Saint- Domingue, this event news of insurrection in Saint- domingue spread quickly across the Atlantic world and overturn plantation economy. Haitian revolution brought mass moblization and France declared war with Britian and Spain over Saint- Domingue and leader’s commited to full emancipation. Saint- Domingue had been known for fastest-growing and wealthiest in new world colonies. Saint- Domingue produces sugar, coffee, and cotton which generate to the French. It was also known as a place for rooted slave and the level of wealth was based on human capital. The demographic was important during the Haitian revolution which was that majority of people in Haiti were African but they speak different language, have different political ideologies and religion. The way of colonical system of slavery in Saint- Domingue was crucial because tortures to slaves were horrible and human life was little value under the French colonial regime. There was time when Africans slave decided to no longer to be slaves and hope to became free. Many slaves attacked and killed their masters and burned plantation and houses. The most influential and revolutionary leader was Tourssaint Louverture. He was considerd as privileged slave and had responsible to make abolished slavery. He was charismatic and encourgaed to the process the emancipation in Saint- Domingue. He mainly explained the situation to people and he mobilized the masses and told them what they think they should do. It seems like he had great respect from his fellowers and he proclaimed that he would brought freedom in this island. The slave revolt given fear througout to slave owners and overthrow the system of slavery was terrified for them. At the same time, it was good source of inspiration to Africans slave and encouraged to emancipation. A Large number of group of Afrian slaves who claimed thieir own freedom and racial eqaulity. Some free colored had been granted eqaulity but many people did not have same eqaulity as whites. They sought courage and determination helps to unite many different African ethnic group and became collective action to against to slavery anf fight for their own freedom.The French National assembly sent second civil commission to save the French colony and maintain social order in Saint- Domingue and insure the enforcement of the April 4th decree. One of commissioner Leger Felicite Sonthonax arrived in Saint- Domingue in 1972. He bagan to alliance to the free man of color and insure their citizenship. In 1793, French declared war with Britan and Spain, France had faced invasion from them. Toussaint Louverture joined Spainsh side to against the France.The Cvil commisionar attemted to hired the slave insurgent who defend the France which offered freedom to them. At the same time, Many people prefered to join in the Spanish side. So Sothonax decided to grant slaves to freedom in the North Province. ” The emancipation proclamation of 29 August 1793 applied only to the devastated North Province at first, but it was quickly extended to the rest of Saint- Domingue, where planter were welcoming Spainsh and British invaders” (Geggus, pp. 99). However, Slaves were changed called ” laborers” in the colony Theier daily live did not change at all and they were still restricted by government. In 1704, the French National convention in Paris approved abolished slavery all its colonies. Napoleon’s seizure of power in 1799 represented a triumph for pragmatists who had little concern for liberty and were more interested in expanding France’s power by building up a strong government” ( Popkin pp. 114). Toussaint Louverture proclaimed the Saint – Domingue constitution and proclaimed the abolition of slavery in 1801. He proclaimed that he would promised to full rights to them. The consitution sent to France, but Saint- Domigue still indentified as a French colony. Nepoleon believes that it is not formal declaration of independence and he refused and reimposed slavery.In 1804, Dessaline proclaimed Haiti’s independence. In August of 1793, Sonthonax granted Gens de couleur and the Slaves emancipation in Saint- Domingue. This decree was a very radical and pivotal moment in history, especially in the Americas. It was important because it was the first colony to abolish slavery, causing many other slave holding colonies to fear that it would put the idea of freedom into their slaves’ heads, possibly leading them to rebel. The road to emancipation started in 1792 when the King of France backed Jacques Pierre Brissot and signed a decree issuing the free gens de couleur full political and civil rights. Not long after, Sonthonax and Polverel arrived in Saint- Domingue. Their job was to help enforce the decree granting these people their rights, deal with counter revolutionaries, and defeat the uprising. Both of these men were advocates of giving the gens de couleur their rights. In 1793 Sonthonax and Polverel took steps to ally with the gens de couleur. Elizabeth Cowill states in ‘Fetes de L’ Hymen, Fetes de la Liberte, ‘Marriage, Manhood, and Emancipation in Revolutionary Saint- Domingue’, “discovering the ways in which the process of emancipation in Saint-Domingue involved a ritual struggle in which the rights and duties of man were fought and secured through military service and, equally important, republican marriage” (Conwill, pg. 126). It was a struggle to gain emancipation because it did not come free. The two commissioners attempted to appeal to the slaves by upholding the code noir and then later promising, through the June 1793 decree, that if they joined the military and fought with the French, they would be free and if they married a slave woman she also would be free. The two commissioners were worried about completely losing the colony, so they also decreed that if one married according to French law, the entire family would be freed. The two commissioners in return expected the newly emancipated slaves to fight for France and defend the colony of Saint Domingue from the insurgents. Later in June of 1793 Spain invaded Saint- Domingue. Sonthonax reacted to this by abolishing slavery in the North Province and Polverel followed suit not long after by abolishing slavery in the Southern and Western Provinces. According to Jeremy D. Popkin, the author of, “A Concise History of the Haitian Revolution”, Sonthonax and Polverel used this as an attempt to, “preserve the colony of Saint- Domingue for the French Republic” (Chapter 3, A Republican Colony of Free Men). The two civil commissioners were trying to save the colony from the Spanish invaders. The emancipation occurred when it did, because Britain and Spain both entered in a war with France in February of 1793 and were welcomed by the white French settlers. The commissioners, seeing this threat and needing to crush it, allied with the gens de couleur and slaves by offering them emancipation if they joined the army. Once the threat became more significant, Sonthonax reacted by granting emancipation to the Northern Provinces knowing full well he needed their help to crush the invasion. “Punishment by whipping is absolutely forbidden and will be replaced, for problems of disobedience, by one to three days in the stocks as necessary. The strongest punishment will be the loss of a part or the entirety of the salary. It will be imposed by the justice of the peace and assessors” (Geggus). The gens de couleur would be punished if they disobeyed the owner or the over seers. They were also punished by being put in jail if they did not own land, were not in the military, or employed. Using these punishments helped the leaders enforce the proclamation because the gens de courleur did not want to risk losing their new found freedom. The Emancipation however, was very limited. Emancipation was only offered to those in the Southern, Western, and Northern provinces under Sonthonax and Polverel. The areas occupied by Spain and Britain were not freed either because the two countries still supported slavery. The decree was also only limited to men and not to the women unless they married a man who was free or in the army. The gens de couleur were still made to live on plantations and still followed the slavery like system. Even though Saint-Domingue was emancipated, it didn’t come without a price. The gens de couleur and ex-slaves still had to deal with the slavery like system and the insurgents who did not side with Sonthona and Polverel. Over the next couple years the people of Saint-Domingue had to continuously fight to keep their new found citizenship and protect the emancipation. The Haitian emancipation of enslaved black was both a political and violent upheaval. Free black, robbed of their civil rights that were seemingly granted on French mainland and slaves, collectively, came together to instill new principles into Haitian legislature. Africans in Saint- Domingue largely wanted civil and political rights, fair treatment from their white counterpart and compliance from plantation owners. However admirable intentions may have seemed they were grotesquely filled with vengeful spite and violence. Laurent Dubois illustrates a scene in November of 1791 as rebels approached the Gallifet plantations as “they had as their standard “the body of a white child impaled upon a stake.” Serving as a symbol of what emancipation looked like in Saint Dominque, a white child on a stake was the terrible beginning of a worthwhile struggle. After slaves had initiated violent revolts against white, the revolutionary transformation displayed social and political violence daily. Terror was a key component at the forefront of the revolution because many whites fled to Cap- Francicais, given the blacks an advantage. Whites who fled to Le Cap were angry and therefore, believed that all blacks and men of color should be killed. Popkin told the story of an anonymous individual that exposed the vengeance white men acted upon. He said that black men and women would be chained up and killed even if they were blameless. Blacks sought revenge in comparable or worse way to the treatment they had received from white plantation owners. Even after the Code Noir was enacted, it was weakly enforced. Its purpose was to ensure that unnecessary physical violence was not put upon slaves. Masters did not comply to the terms of the Code Noir because the slaves were seen as their property to be dealt with as they saw fit. In addition, there was nearly no corrective action from France if a slave holder disobeyed the new policy. Therefore, when the slave revolt began in 1791, the unspoken purpose for many was to kill and torture the white and completely destroy their plantations. The emancipation came in a timelier manner then it may have otherwise because of a quest from Great Britain and Spain to take over the colonies. This sparked conflict as Great Britain and Spain declared war on France. Since many of the black slaves had believed that the royalists held their best interests in higher regard, when Britain invaded Saint Domingue through Hispaniola an alliance was made. The combined forces enabled the insurgents to commit further acts of violence. France recognized that it make supplemental changes to its legislation in order to restore peace to Saint Domingue and solidify France’s claim to it once more. DuBois stated that Bryan Edwards, who went to Saint Dominque after the uprising, detail his experience as a ‘“picture of human misery” that “no other country, no former age, has exhibited”’. The nearly 100,000 black had been reduced to half and 24,000 of the previously standing 40,000 were left. However, the 50,000 blacks that survived the revolution were finally emancipated. The cost of freedom in Saint Domingue was detrimental but without brute force change would not have been readily granted. They could cast off a lifetime of white oppression and begin to rebuild themselves as men with civil liberties the same as any other man. “If, because some blacks have committed cruelties, it can be deduced that all blacks are cruel” stated Toussaint Louverture in 1797, “then it would be right to accuse of barbarity the European French and all that nation of the world”(5).Revolution looks different in every nation that has experienced it. Racism that was deeply imbedded in white culture had to be eradicated before progress could be made. In Saint Domingue violence illustrated the approach to emancipation after other hope failed. “I told you to weed the field,” wrote Toussaint Louverture, “but you tore everything out by the roots”(Popkin, 97). With the brutality of the ‘war of the knives, the deaths of thousands of people, with divided support two men survive and direct a war; both are the champions of emancipation but with ideologically different interpretations. This is an evident indicator of the magnitude and complexity lingering in the air of St. Domingue in 1799. The bubbling of rumors, changing leadership, the constant presence of a military state, a constant threat of colonial power and the conflicting legislation had all lead to a turbulent environment for the people of St. Domingue. As an incredibly fertile and productive region for resources such as sugar, coffee, cotton and indigo, St. Domingue was considered very valuable which created multiple layers of hostility and envy among the hierarchy of civilians, an influx of those who were continually trafficked into the country as slaves and even those outside governments. Considering the demographics of the slave population when compared to the colonialists, the demand for freedom and equality was unavoidable. Fear of revolt loomed in the air and legitimate paranoia consumed the French population for nearly forty years, after all, as demand for goods increased, they had more than tripled the amount of peoples trafficked by repulsive methods into St. Domingue, mainly Congolese. As a response to the imbalance of slaves, mixed race people and white French people, a colony that was once considered somewhat mildly oppressive, began to enact disturbingly prejudicial laws in attempt to maintain control as the mistrust swelled. But the inhabitants had become intolerant of these violent ways and as generations passed and became more interracial, these measures were even more difficult to enact and more adamantly condemned by the general populous. Although the debate for and against exploitation had been occurring since the arrival of colonists on the island of what is now Haiti, it’s debatable what exactly fortified the action on the part of the slave population to start demanding an end to slavery. Perhaps the repeated rejection of proposals of inclusion and basic rights that free black men such as Vincent Oge and Sonthonax’s had continually advocated for. Increased violence and loss of French control may have played a role in the eventual uprisings. Revolts in 1970 that were a response to vicious treatment of slaves and mixed race people lead to the extermination of many activists of emancipation, and action which was meant to enforce distress and generate compliance in the slave population may have lead to the unintended outcome of more vehement arguments and actions for civil liberties for the people of St. Domingue. While we have indicators of the growing dissatisfied attitudes on multiple sides, we know that the first move towards lawful emancipation was through the Decree of May 15th, which granted rights to those who were born to free black individuals. Unfortunately, this may have not been a step into the direction of liberation for the individuals on the island of St. Domingue. This proclamation of emancipation was debatably a farce, considering that is was not truly enacted, possibly out of misinformation or intentionality on the part of leadership. Additionally, this decree was reversed within months. By September 1791, these back and fourth events generated even more suspicion and division across the entire colony. After more instability across the islands, it seemed like every resurrection movement had different goals. In spite of the desires of the slave population, many military leaders such as Jean-Francois opted to negotiate with the French for amnesty and improved conditions for slaves, but this notion was again, rejected. After this point, some insurgents begin to partner with Britain and/or, another invading colonial power, in hopes that they would be granted emancipation. I think that fundamentally, the arguments that supported liberation of the slave population and those, which forewarned the fall of the economy took too long. Simply put, this process of providing half rights, creating proclamations and then rescinding, civil rights in disguise, rights for some and not others created too heavily a divide to satiate the people of St. Dominque. Colonialism from all of the European countries played games through lies and rumors to gain power, leaving the slave population in a state of confusion of who to trust and what direction to move, with the ever present trepidation of making a wrong decision with something as important as freedom on the line. Arguably, it’s even a contentious topic to attempt to understand the desires of those in leadership. This Haitian revolution was a period of about a decade filled with fighting and havoc in the small French colony of Saint Domingue, which thrived off of a plantation economy and a large enslave labor force. On the island, the whites were the minority with the majority; not only were the enslaved angered by this, but as well as the gens de couleur and free blacks. As stated above, Saint Domingue had a plantation economy, which was very profitable for France and very much manipulated, “on a large, well-managed sugar plantation, the work never stops. Either the ripened canes need to be cut, or a field needs replanting after being harvested, or those where the new shoots risk being strangled by weeds need to be weeded” (Geggus Doc. 4). The whites that inhabited the island needed the slave labor for profit purposes, because the money that could possibly be made on Saint Domingue was everything a person dreamed of. Mass fear among whites spread because the possibility of riots or revolts from the enslaved, due to the large enslaved to white people proportion, much was done to repress not only the enslaved people but as well as the free blacks and the gens de couleur. Repression among the non-whites occurred because giving freedom or even rights to free blacks or the gens de couleur would have been a step in the direction towards slave emancipation. With all the trouble that occurred in Saint Domingue, the only destination for the future Haitians was emancipation and complete separation from the French oppressors. Emancipation occurred at the time that it did because in all honestly, the thought of emancipation was finally becoming reality, “for fourteen years we have been victims of our own gullibility and tolerance, defeated not by French arms but by the pitiful eloquence of their official proclamations” (Geggus Doc. 80). Emancipation was a long time coming, since that was the final destination that the formerly enslaved, freed blacks and gen de couleur were focused on reaching. To put it simply, emancipation in Saint Domingue occurred when it did because the French could not keep up with the revolutionaries who would have done absolutely anything for their freedom. The French were physically losing to the people of Saint Domingue, and could not keep up with what they needed to in order to be the dominant force that Napoleon needed and wanted the French forces to be in Saint Domingue. France no longer had a strong number of forces occupying Saint Domingue around the time of emancipation, because the soldiers were dying and falling ill to all the diseases that the French were not immune to on the island, “out of the 30,000 soldiers brought to the island, they only remain 18 or 20,000” (Geggus Doc. 70). With the soldiers falling ill and dying, the price the French were paying for their presence in the Atlantic on top of the price of the war with the rest of the European continent that Napoleon was invested in, was not worth it anymore. Saint Domingue was quickly becoming an economic loss, when Saint Domingue used to be a colony that once made so much money for France. Timeline of events leading up to, during, and after the Haitian Revolution. With the loss of French momentum in Saint Domingue, the soon-to-be called Haitians definitely took advantage of this and were finally in their home stretch towards, what seemed to be almost impossible, emancipation. The final mark to add to why emancipation in Saint Domingue happened when it did was undoubtedly Dessalines’ Armée Indigéne that united those who were still fighting on the basis of freedom for all. Why was this army so important? Dessalines cleverly named this army to categorize the formerly enslaved, free blacks and gens de couleur as the indigenous people of Saint Domingue who were against the French, and all other whites intruding upon their potential freedom. Emancipation in Saint Domingue was not as simple as one battle, the people who were oppressed on this island truly believed in their fight because they knew that grass was greener on the other side, but not always necessarily better. Upon reaching completely emancipation, when the revolution was all said in done, those who now lived in the newly formed colony of Haiti had much to learn, but undoubtedly used what had happened to them and their ancestors as something to stray away from. The Haitian Constitution of 1805 definitely drew upon influences from other constitutions, but made it clear to include that “no white man, regardless of his nationality, may set foot in this territory as a master or a landowner, nor will he ever be able to acquire any property.” The Haitians were being radical towards those who were once radical towards them, but the Haitian Revolution will forever stand in history as being a successful slave revolt who refused to continually be oppressed for the sake of greed from a country thousands of miles away.